Are all the containers travelling on the MARCO POLO similar ? CMA CGM Marco Polo: a first turnaround which stands out! Discover the new images of the CMA CGM Marco Polo on call at Port Kelang. 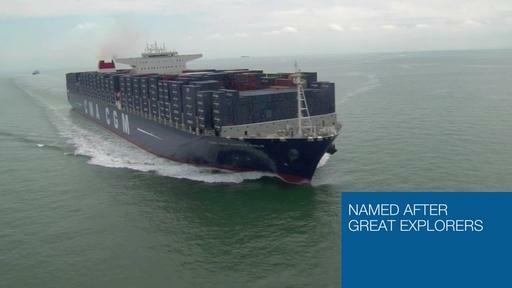 Discover the first video of the CMA CGM Marco Polo's first maneuvers. On 5 November, the CMA CGM Group took delivery of the biggest vessel in its fleet and currently the world’s largest (capacity) containership, the CMA CGM MARCO POLO capable of carrying up to 16,000 TEUs. With this blog, you will find out all about the vessel as well as many interesting aspects of a merchant fleet: from building the vessel, to training those who sail on her, the goods carried and the technical innovations to protect the environment. Copyright © 2012 CMA CGM. All rights reserved.